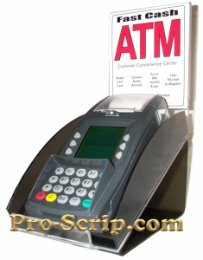 Cashless Atms, Scrip machines, Script Atm as Passive Scrip Atm Investment Opportunities, with direct sales to Investors and Merchants nationwide. Investment Opportunities - Direct Sales to Investors and Merchants Nationwide! Traditional Cash Dispensing Atm Machines are on the way OUT. . .
Cashless Atms are the New Generation of Atms, here TODAY! The future of the Automated Teller Machine is here today and it doesn't breakdown all the time, give out too much money (or not enough), present burglary or break in risks, and it doesn't cost several thousand dollars to own & operate! It's the Cashless Atm Scrip Machine! It's ease of use and low cost operation has it exploading in popularity all across America. But, the best part is that ANYONE can own these machines and place them in retail locations to make ongoing residual income. For details, read the About Scrip page and our FAQ Page. Interested in placing machines in merchant locations and making monthly residual income? We can help you get set-up for hundreds of dollars less than the competition! Click Here for Info Tired of paying fees everytime a customer wants to use their bank card? We can help you save those fees, and even make money on each transaction with our program! Click Here for Info Looking for a hassle free program to offer your merchants? We've got just the program for you! We provide statements and tech-support so you can spend more time selling. Click Here for Info We can customize a program for large corporations with multiple locations that will maximize earning potential and leverage impulse buying from your customer base. Click Here for Helpful Business Links that will Help your Become more Profitable!